A.J. 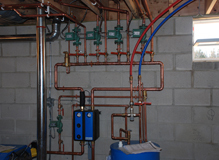 Petrunis, Inc. offers elegant plumbing solutions. Services such as toilet, faucet, and other fixture installations, plumbing, piping, video inspection, and drain cleaning will meet your every need.